Scheduling is one of the most crucial aspects of your septic tank service business. 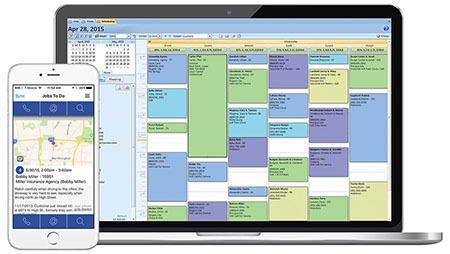 Smart Service scheduling software is the best way to get your workers from point A to point B with all the customer information they need to do the best job they can. With simple QuickBooks integration, Smart Service provides the ability to share customer contact information, work history, and job details with your employees. And it gives you the ability to receive a new job and immediately see which technician is available to take it. Our septic tank service scheduling software is the best way to ensure that your business is running as effectively and efficiently as possible. When you install Smart Service, all of your existing customer data from QuickBooks integrates with the platform. Contact information, project and equipment history, personal notes, and any other pertinent information you had already added into QuickBooks is now readily available when scheduling. This eliminates the run around of cross checking information, rummaging through filing cabinets, and any other inconvenience that stops you from streamlining your scheduling process. Smart Service scheduling software does all the grunt work for you, leaving your employees free to focus on other matters. It’s as easy as typing a customer name into our scheduling software and having their entire history (and future) with your business at your fingertips. How many times a day do you call your septic tank service workers in the field to add, cancel, or rearrange jobs? Phone tag leads to misunderstood messages or maybe a total failure to communicate, but mostly it leads to frustrated or dissatisfied customers. With our dispatching software, you stand to improve employee communication, increase productivity, eliminate the words “phone tag” from your vocabulary, and most importantly for continual business, increase customer satisfaction. Streamlining scheduling is great, but Smart Service takes it one step further by giving you the ability to automatically deploy the assignment to your worker’s tablet or phone with our mobile app. Our mobile app is a continuation of Smart Service that allows a seamless transition of information from the office to your septic tank service workers in the field. Once you’ve scheduled a new job in Smart Service and assigned it to an available worker, the app will send all the information to their phone or tablet. All the information you have access to in the office (new job details, work history, customer contact information, and notes) are displayed in the Smart Service app. They even have GPS coordinates to their newest job so they have an ETA to give the customer. Once your technicians start their day, you can monitor their locations to keep track of productivity and ensure efficiency. After a job has been completed, your techs can immediately update work orders, create new job notes, and collect customer signatures. This lets Smart Service generate a ready-to-bill invoice in Quickbooks. Eliminating paperwork from fieldwork prevents miscommunication and inaccurate billing.